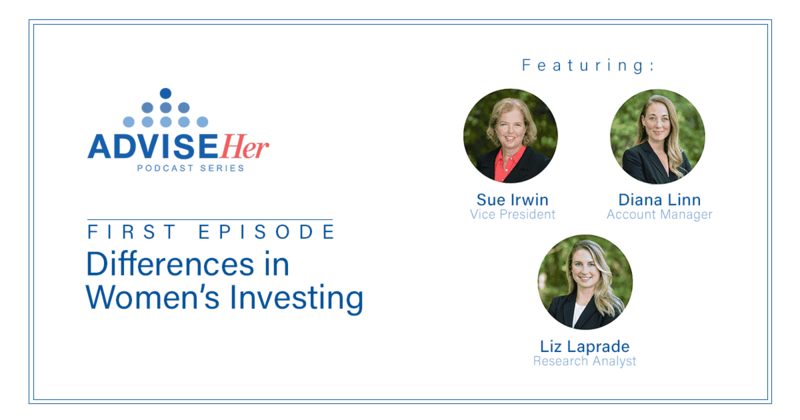 In celebration of Women’s History Month and in partnership with our Women in Wealth Management Initiative, Adviser Investments is pleased to announce AdviseHer, the first in a quarterly series of The Adviser You Can Talk To Podcast episodes that provide clear information about investing and financial issues that affect women. We were inspired to launch our AdviseHer series after hearing from our clients that sometimes found it challenging to find reliable content targeted towards a female audience. Because of that, some feel a lack of confidence when it comes time to make important investment decisions. According to a recent Wells Fargo Investment Institute report, women in the United States currently outlive men by an average of five years—with 90% of women taking a full leadership role for household financial decisions at some point in their lifetimes. AdviseHer aims to bridge the gap with upcoming topics to help listeners understand how investing can help them achieve financial security for themselves and their loved ones.